We began with a Kickstarter. Four years later, we’ve grown into an international community. When we first launched 3Doodler, there was no way we could have anticipated the creative passion our backers would have. Before we knew it, Doodlers from all over were sharing their creations, experimenting with the pens in ways we had never thought of, and pushing the innovation to new heights with projects that left us inspired and awestruck. Launching the way we did, directly to our users, community became an inevitable part of our DNA from Day 1. We’ve kept our ear as close to the ground as we could since then. Four years later, that community stretches across the globe, and continues to find new ways of reminding us how limitless creativity can be with the right tool. Some members of the community have even become full-time members of the 3Doodler team! As Doodlers took on bigger and more ambitions projects—like complete basilicas, full-size cars, and high-end fashion—we wanted there to be a way for artists to share their expertise and help each other improve and innovate, while also helping the wider community. And so we established the Power Doodlers. This group of creative thinkers are as passionate about Doodling as we are, and have shown they have the innovation and skill to bring their ideas and creations to life. Our Power Doodlers are dedicated to art and creativity, and see Doodling as the perfect outlet—whether as a hobby, an educational tool, or even at a professional level. 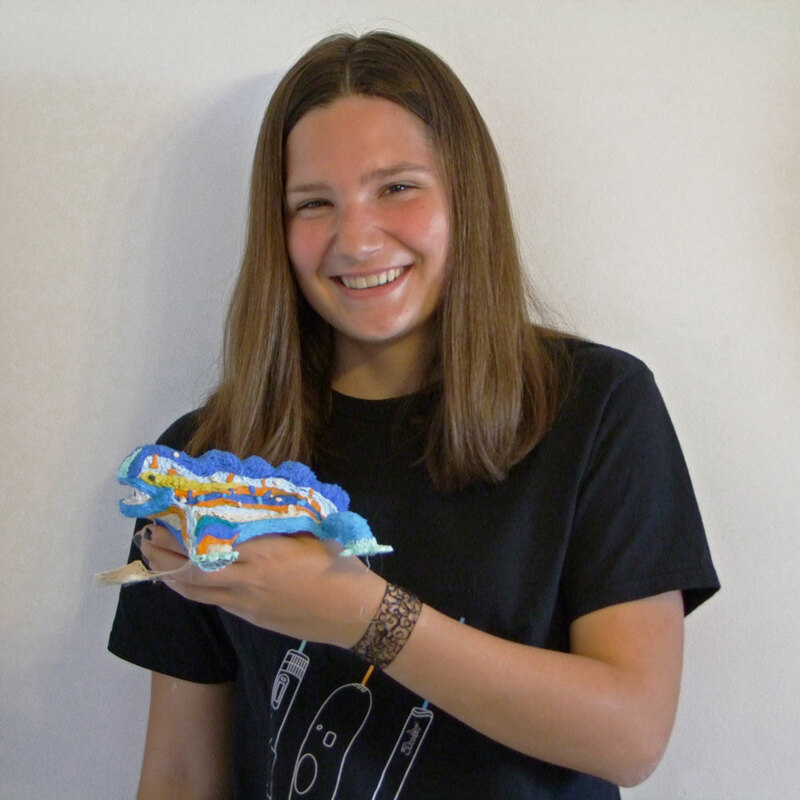 And they want to share their skills with the world through tutorials, workshops, and exhibitions to help bolster and expand the 3Doodler community. Grace is a veteran Doodler based in London who hosts regular workshops for beginner Doodlers. “The first thing I ever Doodled was a hat. 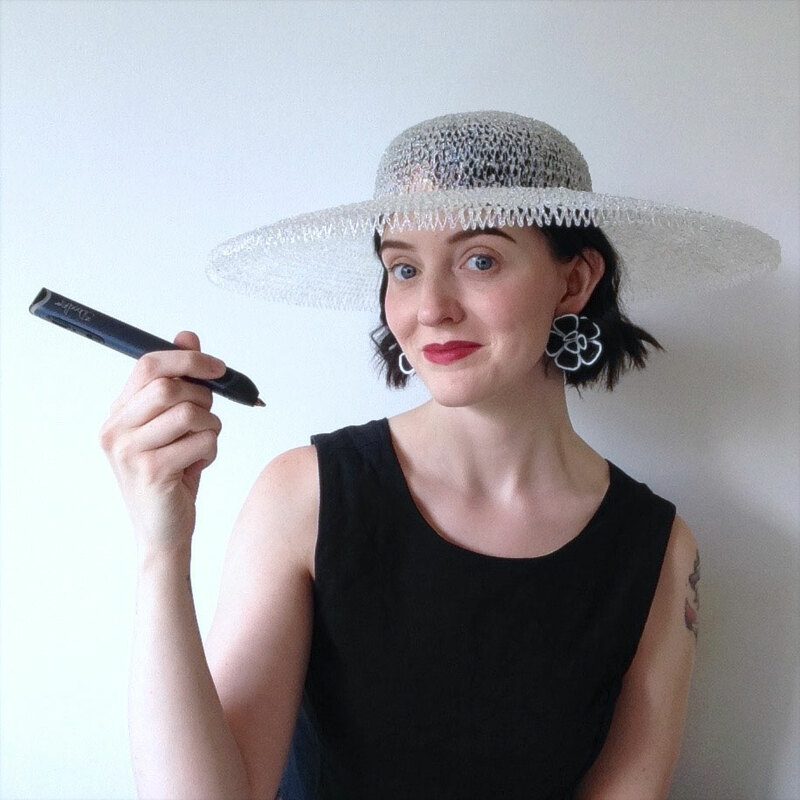 A company called Maplin commissioned me to make something for Ladies Day at Royal Ascot in 2014. Designing it was a challenge as I wasn’t sure how strong or flexible the plastic would be, but it was also exciting to be trying something new. "Doodling allows you to work in a very experimental and organic way. You can have an idea and then immediately try it out." I think I have improved since then by exploring different techniques and trying to push the boundaries of what’s possible. I like that Doodling combines modern technology with something hand made. My background is in textile design and I have always enjoyed the making process as well as designing. Doodling allows you to work in a very experimental and organic way. You can have an idea and then immediately try it out. See more of Grace’s incredible work by following her on Instagram. Hailing from Barcelona, Judith won the 2016 3Doodler Micro Award with a trio of adorable Doodled squirrels. “As an artist, Doodling in 3D has changed my perspective of creating. Everything is possible with a 3Doodler in your hands—whatever you can think of, it can be made. "As an artist, Doodling in 3D has changed my perspective of creating." My first Doodle was so easy to do because I started with some basic projects that 3Doodler offers on their site, and with a few steps I learned a lot. Later on, when I knew how to use the 3Doodler better, I let my creativity fly and now I’m finally able to Doodle everything my mind is capable to create. Follow Judith on Instagram to see more of her projects. Based in Canada, Heather’s masks and her unique Doodling style certainly turned heads. “After receiving my first 3Doodler from the Kickstarter campaign, I was delighted by the immediacy of the plastic extruding pen. I can think of something and minutes later create a model of it. The variety of materials has such possibilities for wearable art, cosplay, sculpture and adds incredible dimensions to my 2D artwork. "The 3Doodler has opened up so many options to express my ideas." I have a connection with the great Rocky Mountains and nature, as seen in my work which largely consists of animals made with variety of techniques. I’ve been studying different materials for use in my artwork. It has been an amazing experience to use the 3Doodler to enhance my existing style of work and it opened up so many options to express my ideas. I fell in love with the medium and I am excited to see where this artistic journey takes me next. 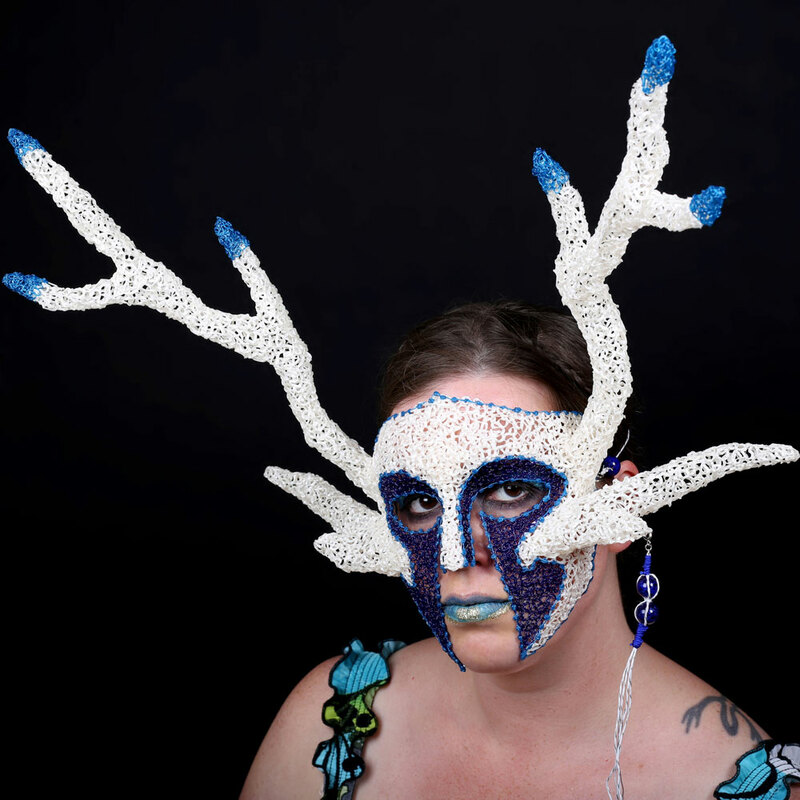 Follow Heather on Instagram to see more of her incredible masks and nature-inspired artwork. Californian Syd impressed us with her entries in our regular Doodle-Offs where she combined Doodling with other design skills. “I am a graphic designer by day, and mixed media artist by night. "The biggest struggle I encounter is having the perfect plan built inside my head, but then having to improvise and let the pen tell you how it should be built." I’ve been using the 3Doodler since the day it was shipped after its first Kickstarter campaign in 2014. Once I saw what it could do I knew I had to have one. Ever since then, I’ve made several figurines based on my favorite animals and pop-culture characters. It’s a great tool to experiment with, and recently I have been incorporating Doodles into my mixed-media art pieces, which have also included use of LED lights. My light-up beehive is a good example of how Doodled additions fit in with other media. 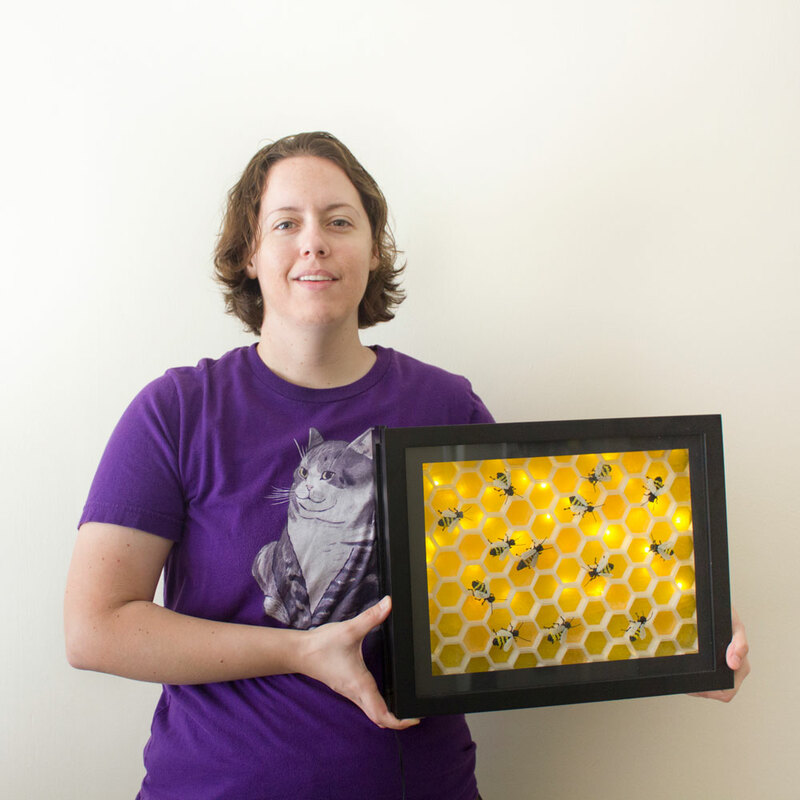 It features 13 Doodled bees (including a queen), 96 3D printed honeycombs (some filled with Doodled honey), and 100 LED lights. Follow Syd on Instagram to see more of her mixed-media creations. Do you have what it takes to be a Power Doodler? If you’re interested in joining our team of dedicated Doodlers, contact us for more details. Be sure to follow us on Instagram and subscribe to our mailing list for regular updates!